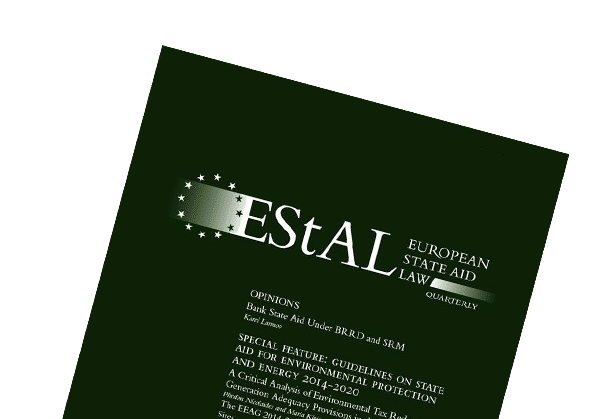 EStAL has developed into the most prominent platform to exchange expertise on European State aid law publishing exclusively double-blind, peer-reviewed contributions, and hence establishing a significant European State aid expert community including academics, policy-makers and practitioners. Manuscripts should be sent to the Executive Editor: weber-abramo@lexxion.eu. EStAL’s philosophy is to serve as an inclusive forum for dialogue and reflection reserved for all academics, officials from European and national institutions and private practitioners dealing with European State aid law. The composition of the editorial board and the diversity of country correspondents mirror this philosophy which also translates into the selection of contributing authors and EStAL’s readership. According to EStAL’s philosophy the law journal offers a unique synthesis of high-quality legal analysis, thought-provoking and shaping opinion pieces as well as concise and useful information on State aid law. Contributions stem from various backgrounds to the benefit of all those dealing with State aid issues. The last issue of 2018 of the European State Aid Law Quarterly is dedicated to the European Commission’s follow-up of approved State aid measures, monitoring their implementation by Member States and evaluating their economic impact, as part of the State aid Modernisation reforms that begun in 2012. Our articles cover the state-of-the-art of State aid Evaluations and how they could look in the future; what changes when moving from ex ante to ex post control in the Monitoring of State aid; a detailed analysis of the Impact of State Aid on Competition; and the national Experience of the United Kingdom with State Aid Evaluation.Two enormously important cases receive expert annotations: The General Court’s ruling on Case T‑356/15 Hinkley Point C (especially important for those daunted by its 736 paragraphs!) and the Court of Justice’s Case C‑579/16 P FIH Holding. We also have the latest State aid news from Belgium, the EEA and EFTA States, Poland and Spain. To close off, returning to our regular sections is the Event Report on the high-level conference Economics of State aid Control: Where Law and Economics Meet, organized by Lexxion Publisher and Vrije Universiteit Brussel, in cooperation with E.CA Economics, which took place on 5 October 2018 in Brussels. View all articles of EStAL 4/2018 here. Despite being as old as European integration itself, State aid rules continue to prompt questions. In the newest issue of the European State Aid Law Quarterly we look at some of these challenges as they affect the Port sector, Public aid and Operating aid in the Airport sector, Selectivity in Corporate Taxation, Tax Reductions for e-publications, Tenders as an exclusion factor and considerations on the eventful FIH Judgment. Two recent CJEU cases are analysed: the difficulty of defining a reference tax system in the final chapter of Heitkamp BauHolding (C-203/16 P), and the Spanish Tax Lease System (C-128/16 P). EStAL 3/2018 also brings the latest news from Denmark, Finland, Hungary and Ireland. View all articles of the current issue HERE. The Summer issue (2/2018) of the European State Aid Law Quarterly (EStAL) is out, with many hot topics in the current debate on State aid law. Articles in this issue address State intervention in the banking sector and the Market Economy Operator Principle; Effectiveness of Subsidies to Young Innovative Companies; the new role of the EC after the BRRD and the SRM Regulation; Evidence Requirements in the State Aid Compatibility Assessment and more. The highly significant ENEA and ANGED cases receive fresh analyses, accompanied by notes on EDF, Naviera Armas and United Textiles, and a national case on State aid in Italy with EU relevance. EStAL 2/2018 brings thought-provoking opinions on the FIH judgment and Past Financial Assistance, and the In-house privilege in the re-communalisation of public services. This issue also reports on important developments in Italy and France. View the table of content on issue 2/2018 here. View all articles of EStAL 1/2018. EStAL accepts submissions of excellent quality only. Responsibility of the factual accuracy of a paper rests entirely with the author. All publications must clearly distinguish themselves from the status quo of discussions among the informed State aid community – in particular through sufficiently broad referencing (as footnotes) – and provide an added value to those discussions. Contributions should not have been published, nor be pending publication elsewhere. Whereas opinions and case notes may be more factual and focused, articles must rely on pre-existing literature and jurisprudence, even if the positions expressed there are to be contradicted. Likewise, submissions relating to very recent developments require less referencing than submissions relating to more established topics. Publications not living up to this quality standard will be rejected. Submission of a manuscript does not imply claim for publication. Optionally before submitting a manuscript, the editors may be contacted regarding the suitability of a given topic for EStAL. The manuscript must also be complete and final in terms of formulation and factual information so that no major corrections – only of type-setting errors or the like – will be necessary after type-setting, when an edited version (the galley proof) will be returned to the author for final checking. Subsequent requests for corrections cannot be processed. All articles submitted to EStAL are subject to its double-blind peer-review process and evaluated for accuracy, quality, novelty and relevance. The peer-review process is an essential and integral part of research and publication, at the same time helping authors improve their work and serving as quality check for the community as a whole. Articles are first assessed for general fitness to the scope of the journal and overall quality by an Editorial Board member. If deemed to be of sufficient interest it is then sent for external peer-review by a recognized expert in the topic covered by the article. Articles may be rejected, accepted pending minor or major modifications, or accepted as is. The latter is extremely rare; authors are hereby advised that the vast majority of papers must be adapted to some extent before being accepted for publication on EStAL. All authors, regardless of position, origin or status, are expected to respect the comments and suggestions of reviewers and those of the Editorial Team. Contributions other than Articles (Case Law Annotations, Opinions, News from the Member States and Book Reviews) may follow a simplified peer-review process, either single-blind or open. EStAL’s official referencing and style guide is OSCOLA 4th edition, supplemented by the points in this Guideline. All contributions must comply with the formatting requirements laid out hereunder. Contributions not respecting these formatting and style requirements will be returned to the author. Articles should not be longer than 8000 words including footnotes. Longer articles may be accepted on a case-by-case basis if more space is justified by the topic. Case annotations should not be longer than 4000 words including footnotes. Shorter contributions may take the form of Opinions on current issues of interest. These should include no or only very few footnotes. News from the Member States should not be longer than 2000 words including footnotes. Book reviews should be around 1500 words in length, with minimal to no footnote references. All submissions should be in MS Word format, single column, Times New Roman, font size 12, line spacing 1 ½. Each article must be preceded by a short abstract (without heading) in italics of five to six sentences, without footnotes (approx. 200 words). 3-5 relevant, specific keywords should be added, separated by semi-colons. Avoid generic terms such as merely ‘State aid’ or ‘EU law’. Every word of the Title should be capitalised except for conjunctions (Headline Capitalisation). The Title’s length should not exceed three lines after typeset (max. 100 characters including spaces). Subtitles are allowed and should not exceed the 3 lines rule either (max. 100 characters including spaces). Author details should be included in a first asterisk footnote (*) inserted after the author’s/authors name. 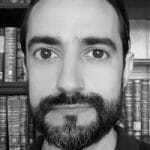 * Prof Dr Christopher Bovis FRSA, H K Bevan Chair in Law, Law School, University of Hull; Managing Editor of the European Procurement and Public Private Partnership Law Review (EPPPL). For correspondence: <epppl@lexxion.eu>. All figures must be sent in separate graphics files (.jpg, .png etc. ), in high resolution and in greyscale (publication in colour is not possible). Tables and figures should not be longer than half a page each. If longer ones are absolutely necessary, they should be treated as annexes and included in separate pages at the end of the article. Every table and figure should have a title. The relevant sources of the data presented or of the tables or figures themselves should be indicated. Within the text, the position at which a table is to be included should be marked by ‘[TABLE X…]’, the tables and figures being clearly numbered. Every table and figure should be referred to. Please do not use boxes. All references should be included in the footnotes: no final bibliographies are allowed. In-text citations of the form Kelsen(1967) should not be used either. All references must be presented in the official reference style, OSCOLA. For CJEU and European Commission Cases and documents, use preferably the forms given below instead. Footnotes should be reserved for referencing and short comments only. A footnote may not in any event be longer than 100 words. Longer comments, even if ancillary or digressive, should be incorporated into the body of the text or omitted. Use only the automatic footnote function in MS Word. Note that footnote references should be placed outside punctuation marks. Do not use linked cross-references (clickable links in the footnote, to other footnotes) as these cause technical problems in typesetting. Case C–280/00 Altmark  ECR I-7747 [88-90]. Case C-579/16 P FIH Holding  ECLI:EU:C:2018:159. Case E-12/11 Konkurrenten.no AS  EFTA Ct. Rep. 266. Case short names are in italics. For judgments not yet registered in the Court collections, the date of judgment is to be given and an indication that the judgment is not yet reported (n.y.r.). Joined Cases T-80/06 and T-182/09 Budapest Erőmű judgment of 13.02.2012, not yet reported . Opinion of AG | AG last name | Date of Opinion | in Case number | Case short name | [year] | Case reference or ECLI | [paragraph/s number]. Opinion of AG Szpunar of 28.11.2017 in Case C‑579/16 P FIH Holding  ECLI:EU:C:2017:911 . Opinion of AG Sharpston of 03.03.2009 in Case C-319/07 P 3F  ECR I-05963 . European Commission Decision | act number | of | date | concerning/on | SA Case number | act name | (OJ or Institutional Reference) | page number. European Commission Decision (EU) 2015/658 of 8 October 2014 on the aid measure SA.34947 (2013/C) (ex 2013/N) which the United Kingdom is planning to implement for support to the Hinkley Point C nuclear power station (OJ 2015 L 109) 44. European Commission Decision 2000/513/EC of 8 September 1999 on aid granted by France to Stardust Marine (OJ 2000 L 206) 6. M Martens and S de Margerie, ‘The Link to the Subject-Matter of the Contract in Green and Social Procurement’ (2013) 8 European Procurement and Public Private Partnership 8.
author, | ‘title’ | (year) | volume | issue | journal name or abbreviation | first page of article |, pinpoint reference. M Martens and S de Margerie, ‘The Link to the Subject-Matter of the Contract in Green and Social Procurement’ (2013) 8 European Procurement and Public Private Partnership 8, 14. M Schmauch, EU Law on State Aid to Airlines (Lexxion 2012). author, | ‘title’ | in editor (ed), | book title | (additional information,| publisher | year), pinpointed page. S Nespor, ‘Global Warming: the Death of Environmentalism?’ in T Ormond, M Führ and R Barth (eds), Environmental Law and Policy at the Turn of the 21st century (Lexxion 2006), 187. Note that where a specific page is being referenced, this is pinpointed with a comma after the publication information but that p. or pp. are not used. short reference | (n footnote number) | page number or [paragraph number]. Fluck and Wintterle (n 45). Only include page or paragraph number if different from the original citation. ‘ibid’ should only refer to immediately preceding references. 1 All websites accessed 31 February 2015. Alternatively, follow each url with the date of most recent access, expressed in the form ‘accessed 1 January 2010’. Always include ‘http://’ or ‘https://’. Citations of publications that are available only electronically should end with the web address (or ‘url’) within angled brackets (< >). Avoid urls that are overly long, or use an url shortener. Do not cite a temporary electronic source. Abbreviations should be introduced simply between parenthesis after the first use of the term, eg: Court of Justice of the European Union (CJEU). Do not add quotation marks, boldface, or terms such as ‘hereinafter’. References to judgment names should be in italics, eg Altmark and PreussenElektra. Note however that it should be ‘the Altmark conditions’! ‘$’, ‘€’, ‘£’ instead of ‘Dollar’, ‘Euro’ or ‘EUR’, ‘Pound’ etc. The word ‘Decision’ should always be capitalised when referring to such legal acts of the European Union; same for ‘Directive’ and ‘Regulation’. Use ‘Court of Justice’ or ‘CJ’ (when referring to the appellate body) and ‘Court of Justice of the European Union’ or ‘CJEU’ when referring to the Curia as a whole. The terms ‘European Court of Justice’ and ‘ECJ’ are outdated/apocryphal and should not be used. Avoid variational terms such as ‘the Court in Luxembourg’. Note also that ‘the Court of Luxembourg’ would refer to a national Luxembourgish judicial body. The preferred title for a legal professional called to the bar or member of an order is Lawyer. Attorney is also accepted. The title ‘Attorney-at-law’ only officially exists in the United States of America, Canada and certain other jurisdictions. Legal professionals not called to the bar in those jurisdictions should avoid it. Their own national titles (Avocat, Rechsanwältin, Advocaat etc…) can also be used. Do not use ‘variants’ such as ‘barrister’ or ‘solicitor’ unless you are officially recognized as one in the United Kingdom.